Methinks Joe Manchin doth protest too much. Senator Joe Manchin (D-WV) is a popular politician in West Virginia. He is often seen as a man who votes “independently” and thinks of his constituents before his party. Actually, this is kind of a “thing” in West Virginia. The voters there pride themselves on voting not for politicians from a certain party, but on politicians who will “do” for West Virginia. Sadly, it’s all a bunch of hooey. It’s based on false perceptions and good politicking from certain candidates. Manchin has this down to a science. Yes, he’s among the most “conservative” Democrats in the Senate, but that’s not saying much. His voting record is actually most similar to Elizabeth Warren (D-MA) and Bernie Sanders (D-VT). See, Manchin just happens to vote “better” on a few key issues, like guns, and he gets to pretend he’s as bipartisan as they come. But the reality is he’s just like most any other Senate Democrat. Which is why when West Virginia’s Charleston Gazette-Mail asked their Senator about his Republican opponent explaining that Manchin will do whatever he needs to just to be reelected, Manchin reacted with such vigor and vitriol. West Virginia’s Attorney General, and Republican candidate to unseat Senator Manchin, Patrick Morrisey, recently argued that Manchin should quit his post in the Democrat Party leadership because it simply proved that he cared more about the Democrat Party than he did West Virginia. When asked if Morrisey’s request and related messaging attempting to tie him in with Democratic leadership affected his decision to not sign the letter, Manchin said he doesn’t care about the attacks and they don’t affect policy decisions. Manchin continued, saying signing the letter could force him into a position where modest changes could not be made to potential legislation in exchange for signing on Republican senators’ votes. “I want to be able to reach out to my friends on the other side and say, ‘Guys, you like anything here, can we do something different, any changes, what would make you comfortable to sign on?’” he said. The hypocrisy from Manchin is thick. On the one hand he pretends to vote with West Virginia always at the forefront of his mind. Yet, he is part of the leadership in his party… a party that wants to strip voters of their 2nd Amendment rights, something that is highly valued in West Virginia. He’s a leader in the party that went to war against Coal, but coal is West Virginia’s most important industry. He’s a leader in the party that hates Christianity, yet he lives in a state that is overwhelmingly positive about the Christian faith. He’s a leader in the party that has been attacking, undermining, and slandering our President, a President that West Virginia voters overwhelmingly support. 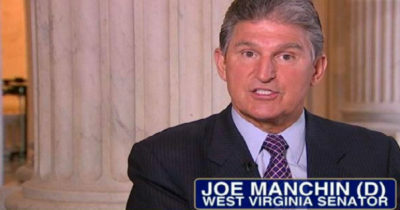 The simple truth is that Joe Manchin isn’t for West Virginia. Joe Manchin is all about himself, his political power, and his party. West Virginia voters should do themselves a favor and send him into retirement in 2018.